No matter your political persuasion, you have to admit that the Israelis are an ingenious bunch. Their latest idea is a simple concept, a virtual embassy for a part of the world where there’s little/no Israeli State presence, the Gulf. Israel, which doesn’t enjoy official diplomatic relations with any of the Gulf states, has launched a ‘virtual embassy in the Gulf’ through Twitter. The account, which is named @IsraelintheGCC, aims to “open lines of dialogue” with people living in the Gulf according to a report by the UAE-based English-language daily Gulf News. According to the Israeli daily Haaretz, the person behind the idea is Yoram Morad, Director of the Department of Digital Diplomacy at the Ministry of Foreign Affairs of Israel. Not unsurprisingly, Israel has always faced challenges when trying to communicate its point of view to its Arab neighbours. However, that hasn’t stopped the State from engaging various mediums to argue for its policies. Israel launched an Arabic-language television channel in 1994 following the announcement of the Israeli-Palestinian peace process. 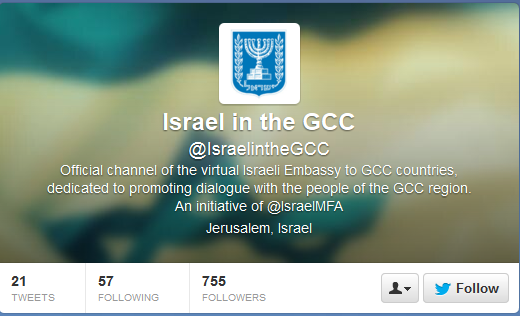 The establishment of the @IsraelintheGCC twitter account follows news of a potential re-engagement between the Israelis and Palestinians as well as mounting pressure on Iran to halt its nuclear enrichment programme. It could be argued that Israel has been much more active than the Arab states in terms of communicating its key messages – there were plans to launch a Hebrew-language channel in Egypt as of last year according to the Christian Science Monitor, but I haven’t heard much in the way of an actual launch. The messaging employed by @IsraelintheGCC, which is being run by the Twitter account of the Israeli Foreign Ministry, would appear to be aimed at propagating a more diplomatic tone than that of Israel’s internal politics. The account, which has tweeted 21 times to date, has only quoted the country’s Prime Minister twice (its fair to say that Bibi Netanyahu wouldn’t win many popularity contests in the Gulf), but it has talked about social media in the Arab world, sustainability issues, and wished followers a Ramadan Kareem. The one time Netanyahu has been quoted was in relation to European sanctions on the Lebanese organization Hizbollah which isn’t well liked in the Gulf due to its pro-Iranian stance. There are tweets in Arabic too. Have a look at some of the posts below. Over the past couple of years social media has allowed companies, politicians and celebrities to directly bypass the media and reach out directly to anyone that wants to listen. Now the same can be said of social media for States who, for diplomatic reasons, cannot establish a physical presence. I’ll be following the account, and am looking forward to seeing how long this project lasts, how much dialogue it generates and how successful it becomes for the Israeli government. This entry was posted in Bahrain, Kuwait, Oman, Qatar, Saudi Arabia, Social Media, Technology, United Arab Emirates and tagged @IsraelintheGCC, Bahrain, Diplomacy, Gulf, gulf news, Haaretz, Israel, Kuwait, Oman, Qatar, Saudi Arabia, social media, twitter, UAE, virtual embassy by alexofarabia. Bookmark the permalink.